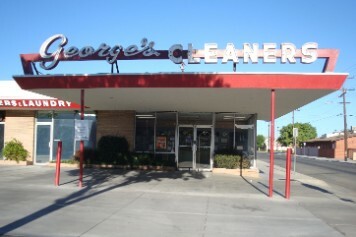 George's Cleaners was founded in 1947 by George Pulos, the son of a Los Angeles dry cleaner. George moved to the Antelope Valley in 1936 to work on the ranch owned by his wife's family. In 1945, he took a job at what was then the only local dry cleaners as general manager. In 1947, George got a $25,000 unsecured loan and opened George's Cleaners on Lancaster Boulevard. In 1954, George moved the business to the corner of Beech Avenue and Milling Street, taking over what was once a blacksmith's shop. George's Cleaners has been open ever since. George was once quoted as crediting the success of George's Cleaners to the commitment to quality and excellent customer service, a commitment George's Cleaners holds to this day. George's Cleaners has been family owned and operated for three generations.